Ranking just after the Huangguoshu Waterfall, the Hukou Waterfall is the second largest waterfall in China and the only yellow waterfall in the world. Yet there’s nothing yellow-bellied about this powerful natural phenomenon! It rests at a point along the Yellow River where the riverbed suddenly tapers down from 300 metres (984 ft.) to 50 metres (164 ft.), transforming tranquil waters into cascading rapids. The result is a magnificent 15 metre-high (49 ft.) and 20 metre-wide (66 ft.) waterfall that gushes down from the narrow opening like bubbling water pouring from a teapot. 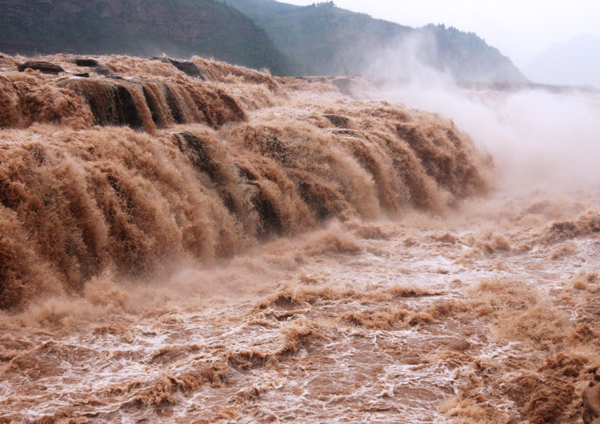 This is what earned the waterfall its unusual name, as “hukou” literally translates to mean “a spout” in Chinese. That being said, don’t go trying to pour yourself a cuppa from this fierce torrent! The waterfall is located at the intersection between the provinces of Shanxi and Shaanxi, about 165 kilometres (103 mi) west of Fenxi City and 50 kilometres (31 mi) east of Yichuan County. The provinces are in fact connected by Qilangwo Bridge, which spans the stretch of river just beneath the waterfall. 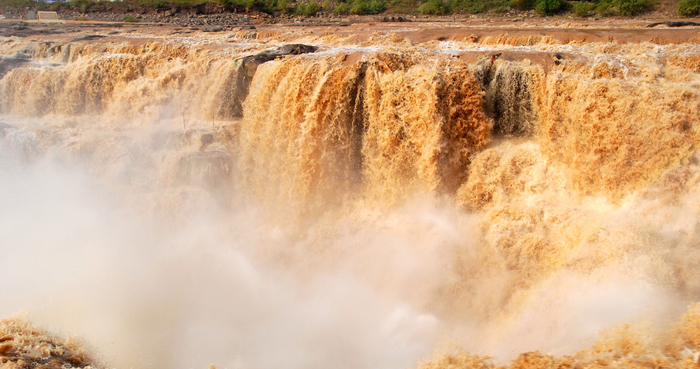 The waterfall itself can be found within Jinxia Grand Canyon and is flanked on both sides by Hukou Mountain. Its size and velocity changes depending on the season, and can easily reach a staggering 50 metres (164 ft.) in width during the rainy season. In winter, it’s said to be particularly beautiful as the water slows and the riverbed is lined by shimmering icicles. According to the locals, the thundering sound of the water can be heard for miles around, and the current is so strong that boats have to be pulled out of the river long before they even get to the waterfall. These boats have to either be shipped by truck or carried around this section of the river before they can be put back in the water. So, while the Hukou Waterfall might float your boat metaphorically, the harsh reality is it’s far more likely to sink it in real life! Just below the waterfall, be sure to look out for a shining stone that the locals call the guishi or “ghost stone”. Rumour has it that this mysterious stone moves up and down depending on the water level and, no matter how high the water is, it’s always partly visible. It might not be the stuff of horror films, but it’s certainly pretty unique!